Question #9: What do you think the school could do to make the use of the iPad better for students? “I don’t think we should use them next year. “One thing: for the cases with the keyboard. A lot of people bought a case with a spongy keyboard and they all got a new case for keyboard. For future years suggest a good case. I use a targus with a hard keyboard. “I find it very useful and much more portable than a laptop but upsetting when people are not using it appropriately and the whole class gets punished for that one person’s misuse. Group work can be hard if group mate is distracted by notifications and is not listening to instructions. Maybe try to find a way to shut the game notifications. Phew. And that folks, concludes the data part of this survey. Next post: So what do we do with all this data? 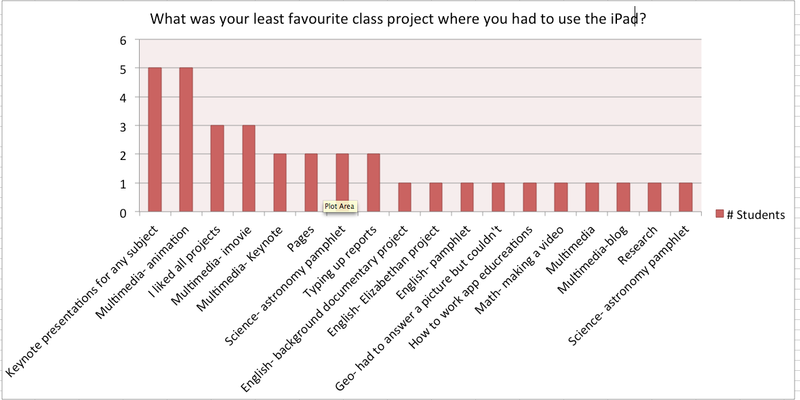 Question #6: What was your favourite class project where you had to use the iPad? Favourite: small story for multimedia where I had to learn pages. Least favourite: animation project for multimedia. However, it was also interesting to hear why they didn’t like certain projects. Most often it was because they did not find the app intuitive, or they simply did not know how to work it. This comment is referring to the background documentary project I had them do at the beginning of the year. Personally, I take this comment as a compliment- it was meant to be challenging! The above two examples are examples of where some troubleshooting help would have been handy. Least favourite: animation creator because you have to draw every single little thing again and again. 60 frames. “I liked it in art when we had to draw on the ipad and then follow steps and do certain things in this app called sketchbook. I also liked the english project where we had to research a different religion. It is interesting to learn about what the students liked doing and what they didn’t like so much. A lot of the times they don’t enjoy it because A) they don’t know how to work it, B) they are experiencing technical difficulties and need support C) it doesn’t fit their personality (they prefer writing to making animations or vice versa). Next up: #9: What do you think the school could do to make the use of the iPad better for students? 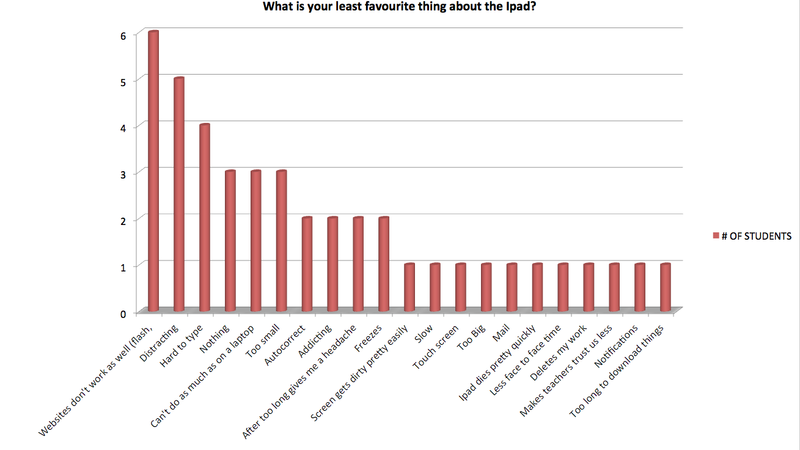 A) What is your favourite thing about the iPad? B) What is your least favourite thing? The main criticism about the iPad parallels the teachers’ main problem with it (and, by the way, the rest of the world): Apple’s blood feud with Flash. They are frustrated that some of the websites they need or look at do not work on the iPad. But the second thing is the flip side of the versatility comment: it has so many things on it it is distracting. It is important to note, that the students were not always talking about their own distraction but that of their colleagues. I appreciated the thoughtfulness most of the Grade 7 displayed when answering the questions. They were able to pinpoint the exact way the iPad is meant to be useful (portability, versatility) and also identify the problems with it. The fact that they identify their own distraction as well as that of their classmates is particularly telling. But more on that in the following posts! 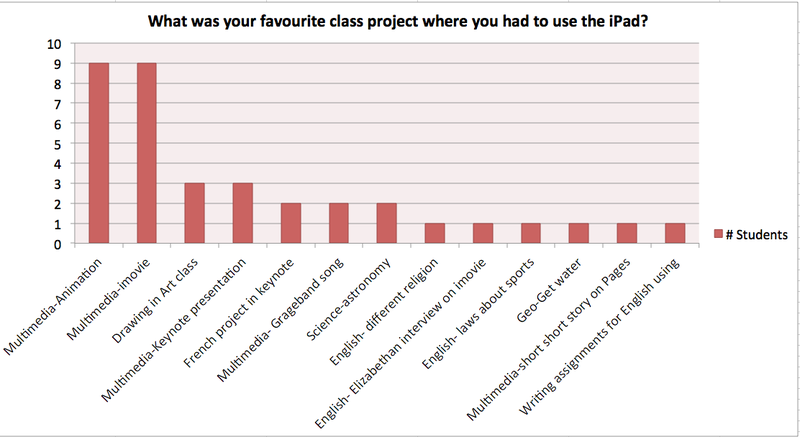 Next post…#6: What was your favourite class project where you had to use the iPad? The least favourite? GENERAL NOTE: It is important to remember that these are the students’ perceptions only. Many of them who have the exact same schedule gave very different answers. 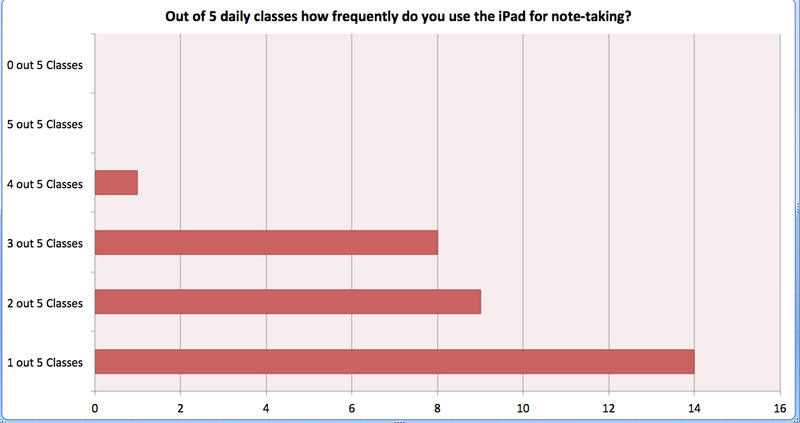 do you use the iPad for note-taking? NOTE: The results for this one could be explained in part by the fact that for many of their classes in Grade 7 they are not required to take notes. The ones who said they take notes in only one class unanimously said that it was for science. 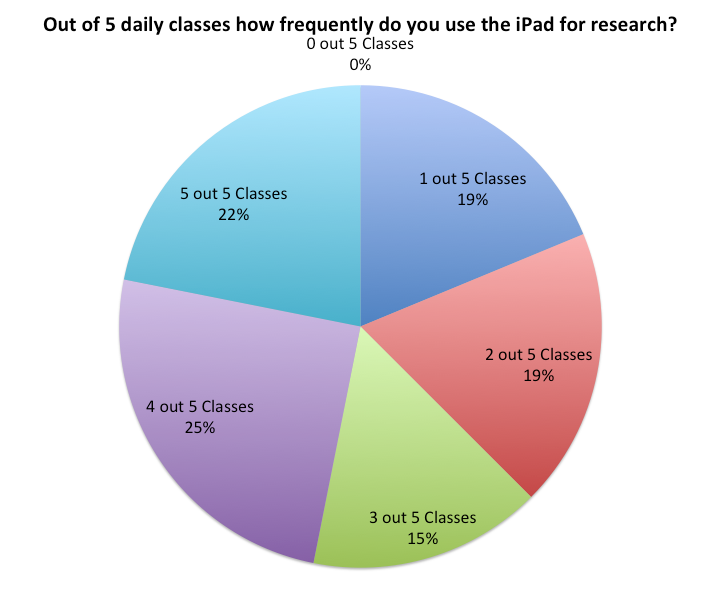 do you use the iPad for research? NOTE: This is a good example of different perceptions- the answers to this question varied a lot given that they all have about the same classes. does the teacher use it for instruction? do you use the iPad for a specific project? 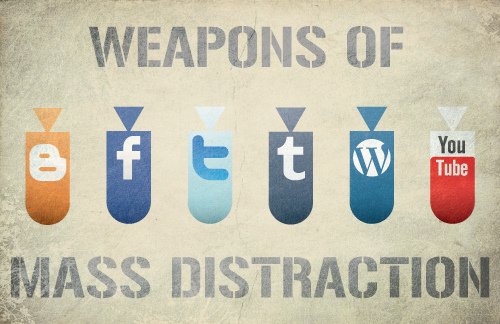 do you get distracted from your class work? NOTE: This was an interesting question. 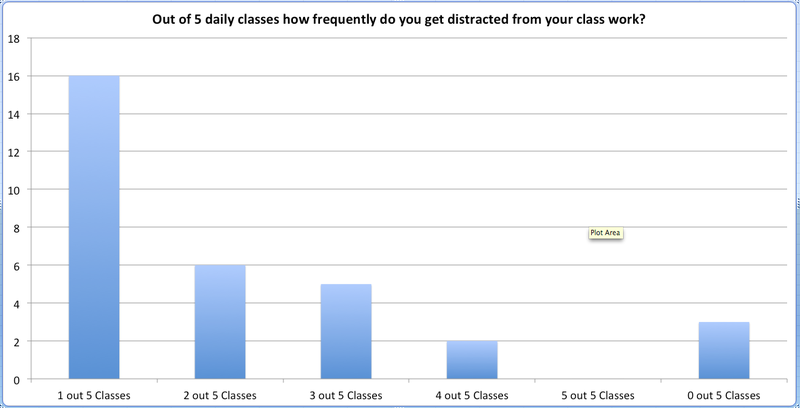 As you will see in the following questions, many students cited the distraction of others as a hinderance, yet the majority claimed they only got distracted 1 out 5 classes. Hmmm… Curious. Very very curious…. But more on this in the following posts! 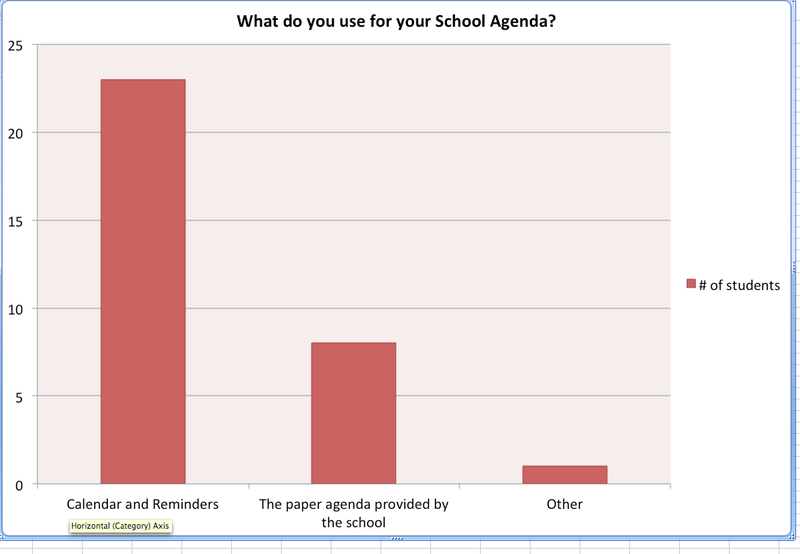 Which means that about 75% of students use their iPads as an agenda. 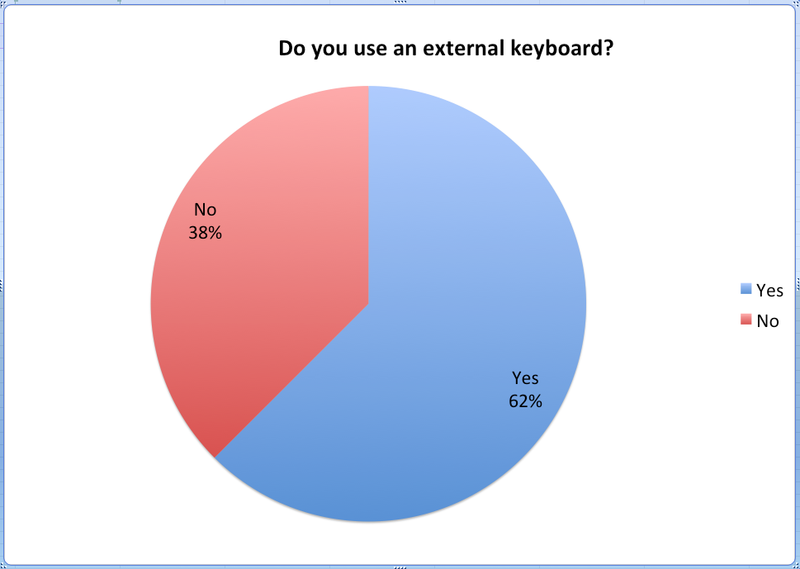 #3: Do you Use an External Keyboard? Note: This is a bit skewed as a few of the students who said no said they started with a keyboard but it broke early on in the year. Most of those who had broken keyboards were using the “squishy” or soft keyboards. They did mention that they are trying to convince their parents to purchase a harder keyboard as they felt it significantly enhanced their iPad user experience. 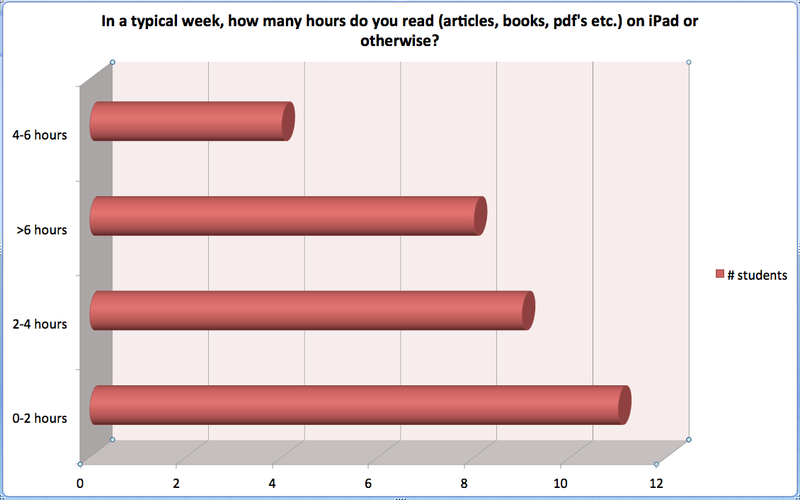 #4: In a typical week, how many hours do you read on the iPad or otherwise? Note: As I mentioned last post, the students had trouble answering this. Part of this problem was that the librarian was giving them the survey and they felt that there might be a “right” answer. I tried to assure them that there was no judgment but I don’t think I was successful. Also, many of the students cited the busy-ness of the school year eating away at their reading time. Although many of the students like to read, they feel they don’t have time. 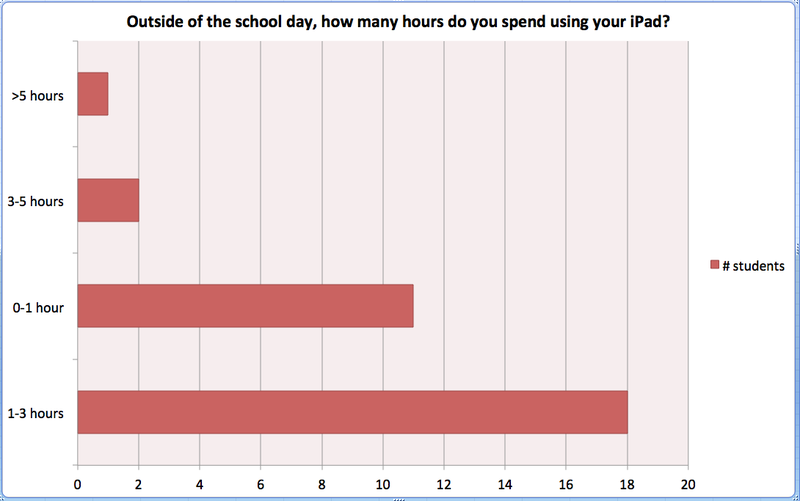 #7: Outside of the school day, how many hours do you spend using your iPad? Note: though I tried to tell the students not to include the time spent on homework, I don’t think they were able to separate the two. The ones who did cited the fact that they did everything on their iPad from leisure reading to games to social networking to homework. 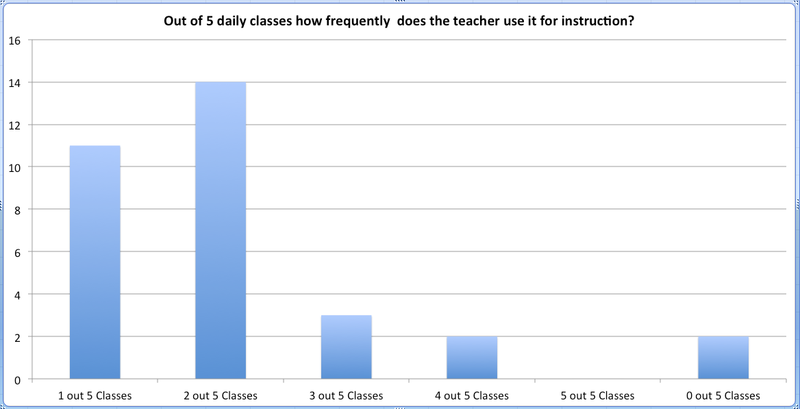 I was also surprised at how many students said they only spent about an hour a night on it. A lot of them said that they liked to do other things when they get home. I know, I know- it has been survey mania here in the library. The one thing I learned about making these surveys is that I have a lot to learn about the survey process. Still, I think the Grade 7 Survey benefitted from the lessons I learned from the Teachers. In many ways, the results were much clearer. This has a little bit to do with the questions I asked, but also the fact that kids usually either like something or despise it. It makes it a little easier to interpret the result. 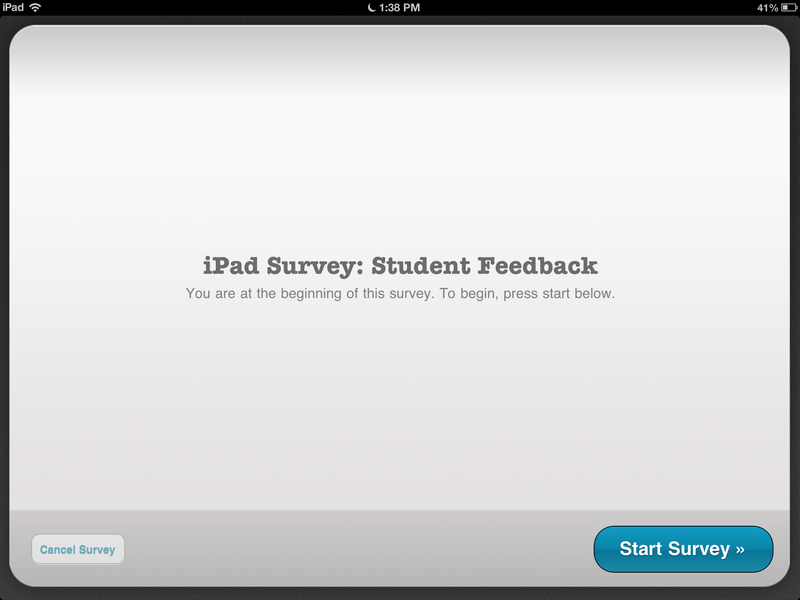 I took some questions from student iPad surveys I found online, but now I can’t find the initial surveys and feel bad. Other survey people, if you see your question here, contact me and I will sing your praises! Quick note- many of the questions were my own, as many of the surveys of students were very specific to that particular high school. I would like to re-iterate that any comments I make on the data on this blog or JUST MY OWN INTERPRETATION AND OPINION.THIS IS NOT AN OFFICIAL, METHODOLOGICALLY CORRECT SURVEY. Because I don’t quite know how to do that yet. But am willing to learn. I think that message might have been lost with my thoughts on the teacher survey. I just wanted to know how to help people better. That’s all. 2. 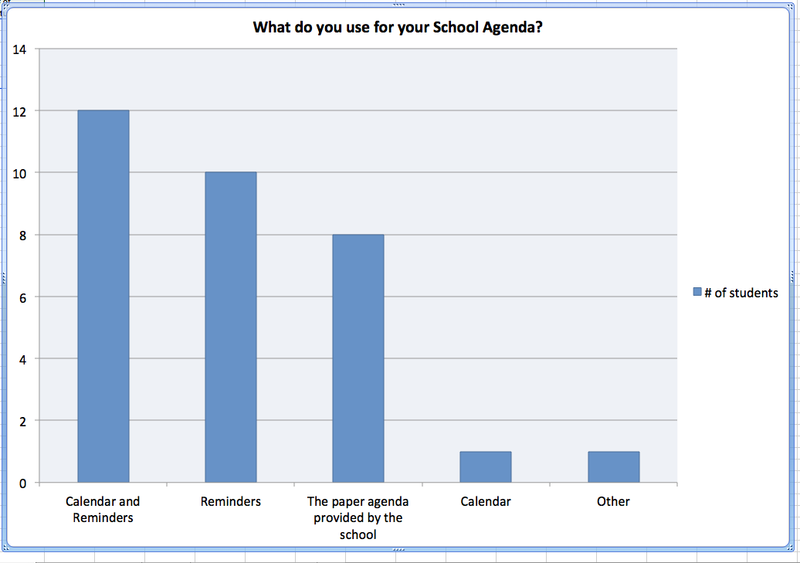 What do you use for your School Agenda? COMMENT: This was a pretty straightforward question for the students. No problem answering it. 3.Do you use an external keyboard? Yes or no? COMMENT: Also pretty straightforward. The only hedging came when a student started off with a keyboard but it broke so now she did not have one. 4. In a typical week, how many hours do you read (articles, books, pdf’s etc.) on iPad or otherwise? 5. 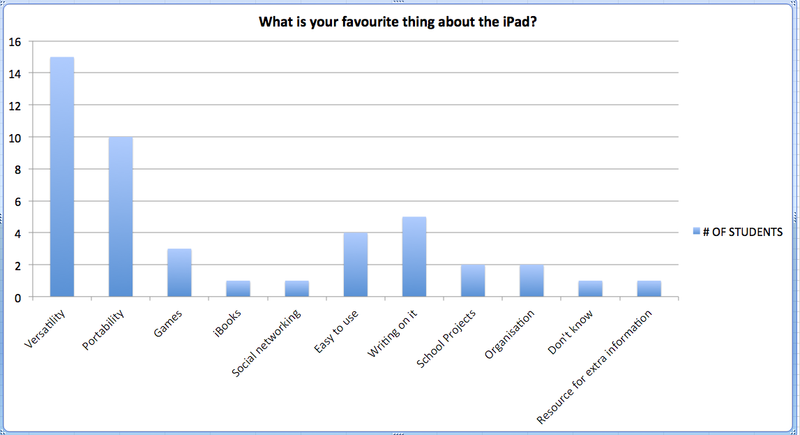 What is your favourite thing about the iPad? What is your least favourite thing? COMMENT: This was an open ended question but pretty straightforward. 6. What was your favourite class project where you had to use the iPad? The least favourite? 7. 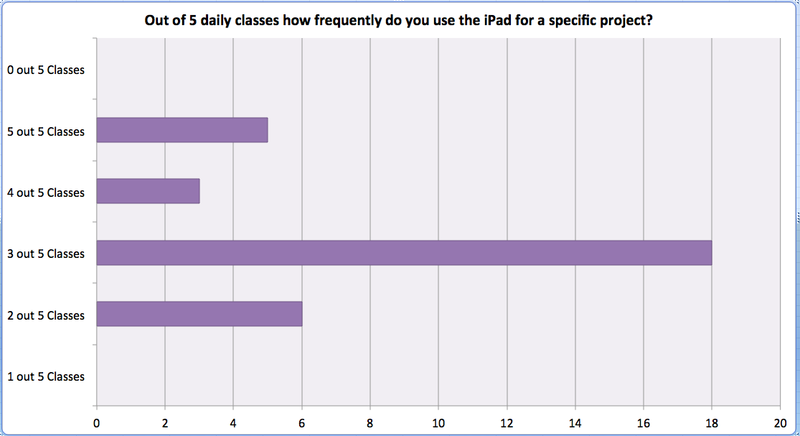 Outside of the school day, how many hours do you spend using your iPad? COMMENT: There was some confusion about whether to include schoolwork or not. I told them not to but I think some girls couldn’t separate school from other activities. COMMENT: This was the hardest for the students and I think it had to do with the actual question. I should have asked for them to think of out of all their classes, which would have been about ten, not just five. 9. 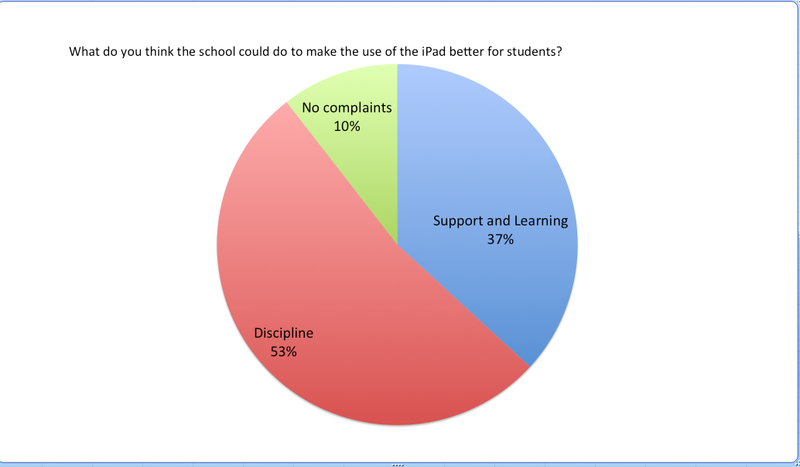 What do you think the school could do to make the use of the iPad better for students? The comments made about whether behaviour problems increases or decreases were surprisingly diverse. This is a good point,as it showcases how the iPad can be a real ally in the challenges with differentiated learning. Aaah. The big one. I think our major lesson learned this year (and one that was supported by my surveying the Grade 7s) was that we need to teach our incoming students how to manage their technology in a healthy, respectful way. Our IT committee has begun brainstorming some simple, uniform methods of classroom management. I think we need to make it clear to the students what our expectations are at the beginning of the year. I am also working on a workshop for students on tips to avoid distraction during classes. A few teachers mentioned this and I think it goes with the last comment. When are students most prone to get distracted? Alas, when you are lecturing. If the students are busy and engaged with the tasks they need to complete in class they are less likely to get distracted. Now, sometimes lecturing is unavoidable ( I do it all the time. Just ask my kids). But if it is possible to keep it to a minima, then switch it up with an exercise or a task with a set time limit on it, that seems to work the best. I like this comment because it acknowledges the very prescient fact that it is not only kids who need to manage their distraction with technology. As adults we are equipped with better tools and more practice at discipline than a 12 year old. It is important to remember that these are skills they have to learn and we have a major role in teaching it to them. The latter part of this quote is the most disturbing and has more to do with the bad etiquette side of behaviour and even bordering on bullying. The collaborative aspect enabled by the iPad only works if people trust each other. Google docs, real time whiteboard apps where the class can brainstorm, depends on a strict adherence to this one rule: never be a jerk. It is jerky behaviour to erase other people’s answers and we should send a clear message that it is not tolerated. I love this last comment. The teacher acknowledges it is a problem that is not going away and that simply putting your foot down with prescriptive rules will not solve it. In fact I heard this from several teachers- that the iPad is going to force them to rethink the way they conduct their classes, they prepare their lesson plans. All in all, the issue of student behaviour with the iPad is not as dire as we thought it was. Many teachers claim there are less problems when the students are dynamically engaged in a task. I just want to go on record to say that I don’t think this is earth-shattering news. I think it has always been that way- students are more engaged when they are occupied. The only difference is that there are now so many ways to to do this at your fingertips. Thank you very much to the wonderful Traf staff for taking the time to talk to me and for being so honest. I think we learned a lot about what is working and what is not working and what we can do in the future to make it better! 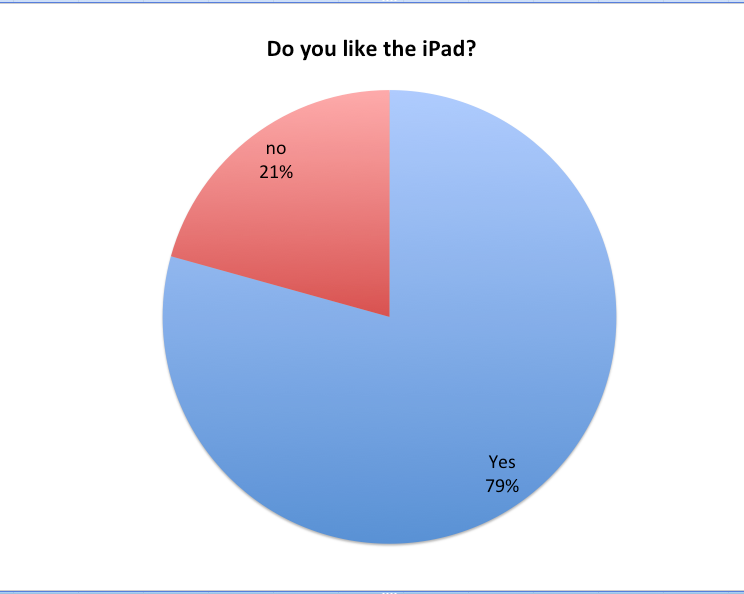 Next: The grade 7 iPad survey!